The kitchen is the heart and soul of your house, the place where everyone gathers even when you have a perfectly functional dining room. It’s also the one room that can make or break the resale value of your house. Most importantly, when designed correctly the kitchen makes cooking and entertaining easier and even fun. Starting a kitchen remodel is incredibly exciting and can be relatively painless with the right approach. Without it … well, you’ve probably heard horror stories from neighbors or friends! So how do you avoid unexpected surprises, ensure your family loves your new kitchen, and add value to your house? We’ve found that successful kitchen remodels all have one thing in common, a plan. In order to have a good plan, you need to understand the process. In this article, we’ll break down everything you need to think through before hiring a contractor. At the end of this article, you’ll be well on your way to starting a successful kitchen remodel. Take a bit of time to observe how you currently use your kitchen. Are you and the family in the kitchen for good portions of the day? Do you or your significant other cook a lot or not at all? Do you cook a lot together? Once you’ve spent some time thinking about the ways you currently use the room take a bit of time to list out the things that could be improved. You might find this very easy, especially if you dislike your current kitchen! Now that you have a good understanding of your needs it’s time to create a list of “need to have” vs. “nice to have”. Creating this list will make the next step (budgeting) a lot easier. The need to have items should be focused on functional issues you discovered in the previous step. An example of a need to have could be more cabinet space or an island so the children can do homework in the kitchen. A nice to have could be removing a wall to open up the space. Keep in mind that moving walls, sinks, and appliances will cost more money and can lead to unexpected costs especially if you have an older house. If you’ve made it this far you now have a solid understanding of what you need and want from a kitchen. It’s now time for the million dollar question. How much should you spend and what does a kitchen remodel normally cost? The simple answer is it depends, a lot. The cost of your kitchen is dependent on your goals, wants and needs along with a lot of other choices (appliances, flooring, tile, fixtures etc.). 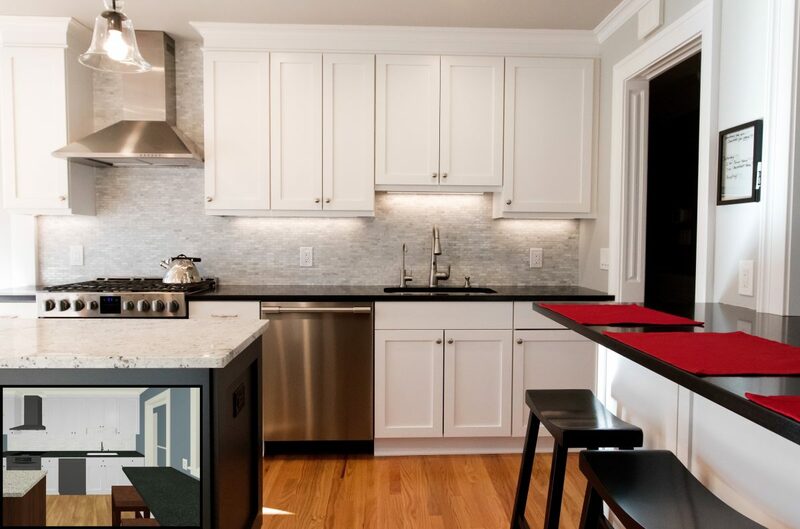 That’s obviously not super helpful so here’s a general rule of thumb: you should spend on average between 5% -18% of your home’s value on the kitchen remodel. Once you’ve settled on a number you should also set aside 15-20% of that number to account for unexpected costs. Designing your new kitchen can be a really fun or daunting experience. In this phase of the project, we recommend spending time looking at websites like Houzz or Pinterest for inspiration.We also recommend collecting images of kitchens, appliances, details, etc. that you’d like to incorporate into your design. This is where things get a bit daunting. There are so many options that it’s easy to fall into analysis paralysis. Don’t worry if you’re overwhelmed or frustrated, instead if you start to feel overwhelmed take some time to look at your needs vs. wants. Then ask yourself if you can narrow down your choices based on your list and budget. Often having constraints leads to more creativity and focus (and less overwhelm). If you’re still overwhelmed or having trouble getting your dream design on paper now might be a good time to consider hiring a designer. Think of a designer like you would a personal trainer. We’ll ask you pointed questions to understand your goals and then provide you with the guidance you need to make the right decisions. We’ve found that customers who hire a designer feel more comfortable about the entire remodel and less overwhelmed. 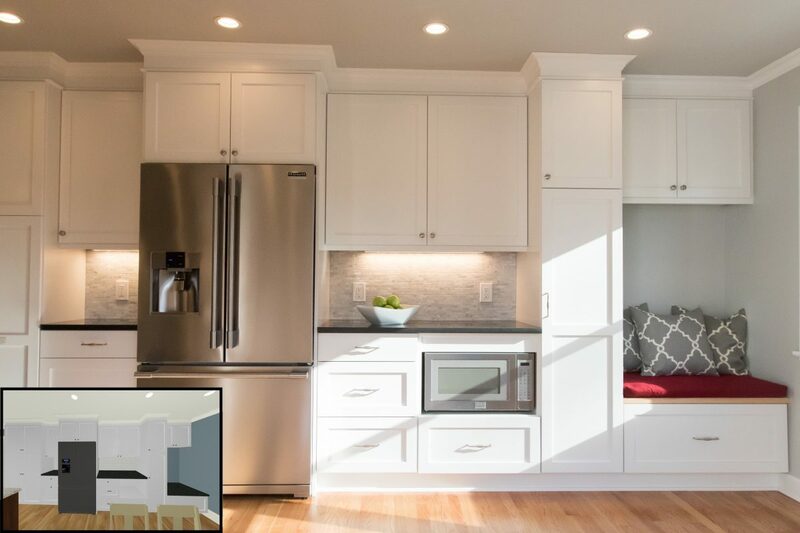 We’ve also found that being able to see a 3D mock-up is extremely beneficial for making hard decisions such as removing a wall, adding a window and giving you a visual representation of the kitchen remodel. The added benefit of being able to see different variations in 3D is that you’re making these decisions without having to spend the money on actually knocking down a wall. In the long run, this can save you a lot of money and peace of mind. If you’re looking for the ultimate in peace of mind then a design/build contractor is for you. There are a few incredible advantages to going this route. Hiring a design/build contractor is kind of like hiring a business coach for your kitchen remodel. Design/build contractors are able to coach you through the design process all while also talking you through the budget. If for instance, you want to knock out a wall we can discuss potential costs and create a 3D mock-up so you can decide if that’s a need to have or a nice to have. There’s an additional (really) big advantage to going this route. Hiring a team means the designer and contractor are on the same page which in turn leads to a smoother process. When the designer and contractor work together they can see problems before they arise and talk through potential solutions. This level of cooperation and communication allows us to have a gameplan for the unexpected and means the entire process is faster. At this point in the process you should have a pretty good understanding of your needs, wants budget, and kitchen design. Now it’s time to hire a contractor and make your dream kitchen a reality! This is arguably the most important step. A great contractor makes the entire process less stressful. A bad contractor… well, you’ve heard the horror stories. To make this process a little bit easier we’ve outlined a few things to look for in our remodeling guide which you can download here. If you run into any questions or want to learn more about kitchen designer email Marcus Marcus@mfmdc.com. If you’re still unsure about budgeting or how much you should spend on your kitchen, stay tuned. We’ll be writing an article that takes a deeper look at the cost of remodeling a kitchen.